I was born in 1948, into a Christian family. We fellowshipped among brethren who regarded the Holy Bible as God's inspired word and who appreciated the Bible teachings of devout Christians such as John Darby, Charles Mackintosh, James Stoney, Edward Dennett, and Charles Coates. During the first half of the 20th century, these brethren had gradually come to depend on the leadership of a brother named James Taylor ("JT"), who was born in Ireland in 1870, migrated to Canada in 1888, and moved to New York City the following year. JT ministered extensively in the USA and elsewhere for over 50 years; during this period the gospel was preached effectively — both on street corners and in meeting rooms — and God saved souls and added to their numbers. Difficulties arose from time to time, however, including humbling trials in JT's family1, and the unscriptural practice of extending household baptism to infants became customary. See Reflections on Christian Baptism. During that same period of time, Charles Coates wrote about the state of things in the last chapters (19-21) of Judges. There, on the one hand, the children of Israel dealt with something that was glaringly wrong in a drastic fashion, which God did not support; on the other hand, the tribe of Benjamin refused to deal with certain sons of Belial in their midst. C. A. Coates went on to prophesy, "This represents a state of things, no doubt, very likely to be found in the last days of the church. There may be a certain indignation about that which is wrong, and faithful dealing with it, and yet it may not be handled in a spiritual way, and the result may be very solemn". See The Moral State of God's People Exposed. When I was about five years old, the Lord Jesus touched my heart during a gospel preaching by a brother named Roger Markham in Chatham, New Jersey, and I trusted Him simply to be my Savior and Lord. During the early 1950s, we fellowshipped with about 200 Christians in five New Jersey towns or "localities" as we called them – Plainfield, Westfield, Cranford, Summit, and Chatham – all within 25 miles of New York City. We also fellowshipped with perhaps 25,000 Christians in other parts of the world. I do not directly recall exercises that arose among us before I was 10 or 12 years old, but I have heard witness from older brethren who do remember, and I've read much of the relevant correspondence. With the Lord's help, I wish to briefly review my impressions and experiences as to these exercises in the New York metro area. There are important moral lessons to be learned as we consider how conditions among us developed, and there may be some blessing in reading the experiences of a simple Christian who has known the Lord's faithfulness, despite his own unfaithfulness, and of his deepening sense of sorrow and responsibility for "my sin and the sin of my people" (Daniel 9:20). James Taylor fell asleep through Jesus in 1953; underlying rivalries and fault lines soon began to surface, which led to serious division and scattering over the next 40 years. Shortly after JT's departure to be with Christ, a case of moral evil surfaced among brethren in Cambridge, England. Two Westfield brothers, Edwin Storr and Jimmy Petersen (one of JT's grandsons), began corresponding extensively with Cambridge brethren, falsely charging them and instructing them, in detail, how to deal with the situation — with resulting cleavage among the Cambridge brethren. During this time, another Westfield brother, Eardly Petersen (one of Jimmy's brothers), invited Edwin Storr to his home for a meal, at which time Edwin showed Eardly some letters he had written to brethren in Cambridge. Eardly, troubled by what he read, voiced his concerns to Edwin, then gathered evidence from Edwin Storr and Jimmy Petersen (in the form of many letters and telegrams), wrote a detailed outline of the facts and the cases against Edwin Storr and Jimmy Petersen, and provided copies to the Westfield brethren. I understand that, when Roger Markham learned of these facts, he stated that it was one of the worst things that had ever happened among brethren. A New York brother named "JT Jr" (one of JT's sons) initially sided with Edwin Storr and his nephew Jimmy, but when the facts became evident, he agreed with his nephew Eardly. Westfield brethren were shocked and indignant at Edwin's and Jimmy's activities, and Edwin and Jimmy publicly confessed their sins. Brethren in Westfield arranged an assembly meeting to clear the Lord's name and to express forgiveness based on their repentance. Within weeks, Edwin Storr and Jimmy Petersen withdrew their confessions, which the Westfield brethren accepted, whereupon Eardly Petersen's wife (Helen) withdrew from the Westfield brethren and wrote to brother Robert Smith of Cranford (her nearest meeting), appealing for fellowship. Robert Smith replied to Eardly's wife Helen, acknowledging that there were things in Westfield that were confusing and didn't seem right, but exhorting her to return to the brethren in Westfield "where the truth is". I believe that Robert Smith's counsel to Eardly Petersen's wife was very wrong, in light of Numbers 14:18: "Jehovah is slow to anger, and abundant in goodness, forgiving iniquity and transgression, but by no means clearing the guilty". By accepting the withdrawal of Edwin Storr's and Jimmy Petersen's confessions, Westfield brethren really cleared two guilty persons — the terrible results of this leaven will become clear as you continue to read. Even if Westfield brethren were, in a way, "caught on the rebound", it no way justifies them in absolving Edwin Storr and Jimmy Petersen. Eardly Petersen and his wife Helen attended Cranford meetings for several months and again appealed to Cranford brethren for fellowship. But they were rebuffed, and they finally began to break bread together in their home. During the late 1950s, the five New Jersey localities mentioned above — Plainfield, Westfield, Cranford, Summit, and Chatham — merged into one locality called Plainfield, with a central meeting room in Westfield, at the behest of JT Jr. JT Jr continued to consolidate his leadership role, notably at a Bible conference in London, England during an exchange with a brother named G. R. Cowell concerning the phrase "Wherefore come out from the midst of them, and be separated, saith the Lord, and touch not what is unclean, and I will be to you for a Father, and ye shall be to me for sons and daughters, saith the Lord Almighty", 2 Corinthians 6:17-18. Around 1960, JT Jr began to categorize all persons with whom we were not actually breaking bread as iniquitous persons and taught that we should thus not eat with them. Robert Smith and his wife did not agree with JT Jr's extreme and wrong teaching as to this, and withdrew from us in 1961. Eardly Petersen and his family, and Robert Smith and his family, sought to be reconciled with each other, but after Eardly's wife asked Robert how he felt about the Cambridge/Westfield matter and Robert refused to review his role in it, their attempt at reconciliation was aborted. Robert Smith and his wife subsequently began fellowshipping with the so-called Cowell brethren. In 1964, we withdrew from Jimmy Petersen and kept him out, under JT Jr's influence, for "not having the Spirit". Plainfield brother Cyril ("Cy") Dadd, and several others, played responsible roles in this matter. Jimmy had been a troubler for years since the 1955 Cambridge affair. He would confess that he had sinned when he was proven wrong, he would be forgiven, and then he would start meddling again soon after. But it wasn't right to withdraw from him on the basis that we felt he didn't have the Spirit. This was JT Jr's way to keep him out — Jimmy couldn't confess and ask forgiveness for "not having the Spirit"! At the time, Jimmy appeared contrite; I wondered about him being withdrawn from, but I said nothing. I now know that it is wrong to disfellowship a person solely on the basis of a subjective impression. During the 1960s, we often rode into Brooklyn, New York for their midweek Bible meetings with Dr. Robert Stollery of Summit, who was JT Jr's personal physician. One evening in 1965, JT Jr did not attend the meeting. During the drive home, Dr. Stollery said quietly that JT Jr was in the hospital to get dried out, to change his blood (i.e., for alcohol abuse). This troubled me, but I expected older brethren would handle it rightly. On September 29, after JT Jr left the hospital, he immediately raised the issue of "commercialism in the assembly", a valid concern that diverted attention from his own moral issue. Around this time, several brethren here arranged privately for Edwin Storr to take the lead after the brother who had been taking the lead was beat up in New York City and later murdered, having been involved in a morally wrong relationship. Looking back later, I realized that JT Jr was publicly, in meeting after meeting, under the influence of alcohol (though sometimes he would be at a Bible reading perfectly sober), yet brethren in New York failed to raise the matter publicly. And it got worse in the late 1960s — the joking and nonsense that came into many of these readings made them seem kind of fun at the time, but the Lord was not pleased and the Spirit of God was grieved at what was proceeding. JT Jr did have an Irish wit, and we used to go to a Bible reading, wondering if it was going to be sober (boring?) or hilarious. Some of us young people started to drink socially around that time, seeing it was condoned by our leaders and elders. After that incident, I lay low. When disturbing reports started filtering through about JT Jr's corrupt conduct at Aberdeen, Scotland meetings that Summer, my conscience was submerged. As far as I was concerned, the older brethren could handle the problems! Aberdeen was far away and we young people were having a good time together. The nearest meeting (Peterhead) accepted Aberdeen's judgment, repudiating their meetings with JT Jr, but JT Jr returned home and told us that all the brethren in Scotland were out of fellowship, and we accepted it. I just assumed that JT Jr was right. Even when JT Jr summarily withdrew from a well-regarded New York brother — Bufton Parker — during a phone conversation and two other brothers questioned this publicly and left the meeting in New York, I just figured that the opposition was gone. Then a brother in our local Summit meeting, Bob Dadd (Cy's eldest son) suggested a subject at our local Bible reading. There was a quieter, more restful atmosphere in that reading, which I remembered from when I was younger, but had experienced only rarely of late. About 30 of us young people from Plainfield gathered for a picnic that Saturday afternoon, talking about what had taken place. The general consensus was to follow JT Jr — he was our leader, after all! But a few of us weren't sure. My brother Roger and I left the picnic early, to go fishing. But neither of us felt too well, so we went home instead. My father, mother, and brother Richard were in Philadelphia for fellowship meetings with Cy Dadd, and had not yet returned home. Soon after we arrived home, Bob Dadd, who lived a block away, appeared at our door with his two little girls. "You're my nearest neighbors, Steve", he said, "and I would just like to review what happened in New York this morning". He said that we must go by witnessed facts in this matter — "In the mouth of two or three witnesses shall every matter be established". I thought, "What is he saying? Bob has been right in there, supporting JT Jr all along, as far as I could tell!" But I remembered the Bible reading that Bob had suggested, and I thought I had better hear him out. He told us that Edwin Storr and others had arranged for an announcement to be made in each local room, before the Lord's supper, stating that we were in fellowship with JT Jr and two of his supporters. He said that if that announcement were made, he could not accept it and would have to withdraw from iniquity and remember the Lord at home. I realized that it would be wrong to make such a privately arranged announcement, without discussing it together publicly beforehand. I realized, too, that I had 12 hours to make a decision which would affect the rest of my life. I called Billy Petersen and two other New York brothers — the contrast was alarming and clear. From the first two, witnessed facts as to moral evil; from the third, coverup, denial, and attempt to justify wrong. Roger and I visited two of our local brethren, Henry and Doris Berg, that evening. They felt that the answer was to be "100% with JT Jr". I knew then that something was very wrong — with their judgment and with me too. I had been going along, having a good time, and I had no power to help anyone else. Let me just add here that when persons declare their "100%" allegiance to a particular person, they have really formed a cult of personality, and can no longer be said to be gathered to the name of the Lord Jesus (Matthew 18:20). My folks arrived home from Philadelphia – thank God that Cy Dadd, most of the Philadelphia brethren, and my folks saw the matter clearly! That night, the only thing to do was pray. And one thing I fervently prayed to God, was that if something like this ever happened again, let me help. At the room where Cy Dadd and Edwin Storr were local, Cy and a few other brethren said they could not accept the announcement; Edwin and others walked out. Those who remained broke bread in the room, and it can be rightly said that Plainfield brethren ratified New York's action with respect to JT Jr. At our local room, several of us said we couldn't accept this decision, and withdrew. Dr. Stollery stood up as we left, said, "I guess it'll come up Tuesday night", and sat down again. We broke bread in Bob Dadd's home that morning. A few weeks later, during a Bible reading, Cy Dadd stated emphatically, as to what we had been through, "We're not going to let this happen again". I well remember it — and I believe he meant it at the time. After this Aberdeen/New York division, we were breaking bread with about 7,000 brethren; those who followed JT Jr numbered perhaps 15,000 or 20,000. In late 1970, I was drafted into the army and trained at Fort Sam Houston in San Antonio, Texas between January and May, 1971. Basic training at "Fort Sam" was for conscientious objectors only, and I met several devoted young Christians there who were associated with the Navigators and Campus Crusade for Christ. I volunteered for a skin testing program at Letterman Army Institute of Research in San Francisco, where I was stationed from June, 1971 thru July, 1972. During most of my time in the army there, one question would come up, in care meeting after care meeting. The San Francisco brethren had withdrawn from a brother shortly before the Aberdeen division. He had asked for more time, but the brethren withdrew from him anyway. The question at issue was: "Could we or should we have given him more time?" Some felt that he should have been given more time; others resisted this for many months, feeling only that he could have been given more time. Finally, the San Francisco brethren came to one mind that they should have been gracious to him and given him more time, and they confessed to him that they had been wrong. This impression stayed with me. Meanwhile, back in New Jersey, Bob Dadd and others had visited Jimmy Petersen and, not being fully aware of his actions during the 1950s, felt that he was repentant. Cy Dadd told them that Jimmy had been a troubler, but that if he was repentant, we had to receive him. Robert Smith claims that he asked Cy what he would do about Jimmy's drinking, and that Cy replied that the first time it came up, it would be dealt with. Others had doubts too, but Jimmy was received back into fellowship without morally resolving his role in the 1955 Cambridge and Westfield matter (when he had confessed his sin and then publicly withdrawn his confession). Among JT Jr's followers, JHS emerged to take the lead after JT Jr passed on in late 1970, and Edwin Storr was withdrawn from, perhaps being viewed as a potential rival to JHS. Shortly thereafter, Robert Smith and Edwin Storr reconciled for a time. (Years later, I asked Robert Smith if they had reviewed the Cambridge/Westfield matter when they were reconciled; Robert replied that they did not because he didn't want it to come up again.) Some time later, after Edwin Storr and Robert Smith parted company, Andrew Robertson and Robert Smith were reconciled for a time. In August, 1972, I returned home from the army and was surprised to find Bob Dadd discouraged and disheartened. During my last visit with him before he left, he said: "My father and Jimmy Petersen run things in this locality; whatever they say goes", and so Bob went away, eventually to Open Brethren, but he did not charge us with iniquity. In New York City, Billy Petersen also left, and began fellowshipping with Open Brethren. During the mid and late 1970s, Jimmy Petersen again began his meddling ways and appeared to be under the influence of alcohol on several occasions. In 1980, after a meeting one evening, Jimmy's son, Jimmy Jr, (who had been brightly converted after a recent auto accident), raised concern about his father's heavy drinking. His father turned to him and said sharply, "I told you not to say anything about that". We looked into it, found that the charges were true, and known publicly, and arranged an assembly meeting. My wife and I were away, visiting San Francisco and Los Angeles brethren, during this meeting. The brethren here postponed judgment to a second assembly meeting, when my wife and I were still away, then to a third assembly meeting when Cy Dadd and his wife were away, and at which my wife and I were present. Mindful of what I had learned in San Francisco about being gracious, I asked Jimmy Petersen at this third assembly meeting if he would like more time to consider what the brethren had laid before him, and he said that he would. He came to the next meeting and told us that his wife had told him that surely he could see he had sinned, and he admitted that he had sinned. I, and then my brother Richard, told Jimmy that the brethren forgave him. I understand that Jimmy had written to Frank Mutton (whose monthly periodical Jimmy distributed in the USA), stating that he expected to be "out of fellowship" for several weeks. Nevertheless, we showed him mercy (James 2:13), but we failed to purge out the old leaven (1 Corinthians 5:7) in this serious public moral matter. Jimmy Petersen Jr and four other brethren (Tom and Pat Hawkins, Paul Druckenmiller, and Carolyn Hjort) left us shortly thereafter. Jimmy Jr told me about 12 years later that he left because he felt we had no power to deal with evil. In 1982, I asked a local brother named Don Pfingst to baptize2 our youngest daughter, but he declined without stating why. As a result, I asked San Francisco brother Arthur Widtfeldt, who was visiting his father-in-law, Bufton Parker, in New York. That evening, Arthur told us that in a public moral matter such as Jimmy Petersen's two years earlier, discipline must be exercised to clear the Lord's name: "Remove the wicked person from amongst yourselves." 1 Corinthians 5:13. I noted his concern, but didn't know how to work this out since two years had elapsed. Jimmy Petersen meddled extensively in the West Coast situation, which culminated in a heart-breaking division three years later. San Francisco brethren subsequently linked on with Robert Smith and other brethren with whom he fellowshipped. During this period, Jimmy Petersen purchased the building where our meeting room was located; we rented the meeting room from him on a month-to-month basis. In 1991, some brethren in a small meeting in Adelaide, Australia charged a local brother, Jim Dover, who had volunteered to fight brush fires in his district, with being a Country Fire Service (CFS) member and thus in a diverse yoke (2 Corinthians 6:14). They withdrew from him solely on this account. One Adelaide brother, John Johnson, believing that this action against Jim Dover was unjustified, appealed to his local brethren to reconsider; when they refused his entreaties, he separated from them (see 2 Timothy 2:19-21). Most Australian brethren — including those in Adelaide's nearest meeting — agreed with John Johnson, but brethren further from the scene, influenced by reports from Jimmy Petersen and certain other brothers, generally accepted the action against Jim Dover. In late 1992, brethren in Edmonton, Alberta and Bendigo, Australia (who had accepted the action against Jim Dover) invited Jimmy Petersen to teach at their upcoming 3-day Bible conferences. Around the same time, Jim Renton of Edinburgh, Scotland ministered at fellowship meetings here in December, saying that he didn't know anyone who was filled with the Spirit. This disturbed some of us; two days later, Jimmy Petersen prayed in the prayer meeting with a slurred voice, and Jim Renton asked a brother privately if Jimmy was back on his old problem. When my wife and I learned that Jimmy had been asked to teach at two Bible conferences, we realized that he was not qualified to serve, based on 1 Timothy 3, and we wondered how the Lord would work this out. The next day, Jim Dover and visiting English brother Peter Alexander came across the CFS membership roster without Jim Dover's name on it. Jimmy Petersen, not knowing this, spoke that night on the need for right report, referring to the two reports in 2 Samuel 18. Another local brother, Ted Druckenmiller, then spoke on Proverbs 10:18 and 2 Samuel 16:1-4, 19:24-30, referred to the CFS roster, and said, "Let the brethren just be searched by what the Lord will bring to light". After the meeting, Jimmy called Ted, telling him to withdraw his word, and began his drinking binge that very night. I faxed a letter to brother Mark S- in Adelaide the next day, asking him for two or three witnesses as to the charge against Jim D-. Mark replied, refusing to provide witness or confirmation. As these events began to unfold, I recalled Arthur Widtfeldt's concern in 1982. We prayed and searched out the teaching of scripture as well as comments by JND, CAC, JT, and others, and found that Arthur's outlook was biblical. (See 1 Corinthians 5, JND Collected Writings volume 1, pp. 344-345, JT New Series volume 12, pp. 24-25, and CAC Letters, pp. 268-269). We invited Cy Dadd and his wife to our home Lord's Day evening, January 10, after their return from Glasgow, and reviewed our exercises with Cy. I showed him my letter to the Adelaide brother, asking for witness to their charge against Jim Dover (which Cy said was a good letter) and the Adelaide brother's reply. When I pointed out his refusal to provide witness, Cy said, "Well, that's the salient point". After conversing as to Jimmy Petersen's history, my wife said to Cy, "We didn't know anything about all this"; Cy replied, "No". (We had seen Jimmy somewhat under the influence at times, but did not realize the extent of the problem). At the end of our visit, I said to Cy, "After 1970, we said we weren't going to let it happen again — we've let it happen it again" (i.e., an alcoholic with perverted judgment becoming influential and being invited to teach among us — see Proverbs 31:4-5). Tears welled up in his eyes, but he said nothing. We withdrew from Jimmy Petersen on January 12 for public drunkenness (1 Corinthians 5:11), known to the police, medical personnel, members of his family, and witnessed by us in our January 12 meeting, as eating the sin offering and conscious of the awful effect of the leaven of unrighteousness. Cy was silent during the assembly meeting, but told me as Jimmy angrily walked out, "There's no repentance there — he's just exposing himself". Cy's wife Grace told my wife Jane, "We've put up with this for twenty years". Ted's wife asked Cy, "Will Shirley [Jimmy's wife] be all right?" Cy replied, "She'll be all right. She's used to it". I called Arthur Widtfeldt soon after to confess my failure in 1980, feeling deeply the cleavage that had come between us, in which Jimmy Petersen had played such a large part. In early February, Jimmy, after prematurely leaving an alcohol treatment facility in Pennsylvania, wrote a harsh letter to Cy Dadd, denying he was drunk in the assembly meeting (a lie) and reminding him that he was put out, and kept out, of fellowship in 1964-70, "largely on the instructions of a brother in another locality – and on whose instructions my wife was taken from my home". Jimmy thus evidently still held that matter against brethren in February, 1993. Around that time, Cy preached in New York; after the prayer meeting next evening, he told me, "There's a lot of opposition to what we've done", and was clearly shaken by it. Nevertheless, he agreed with me that we had rightly withdrawn from Jimmy. The seriousness of the situation began to dawn on me; in view of brethren having confidence in what we had done, I drafted a letter which reviewed the witnessed facts and the principles that governed us in this matter and owned my unfaithfulness to the Lord for failing to clear His name when the matter was before us in 1980. Cy opposed making this letter available to brethren generally – his immediate reaction was: "That hits me right between the eyes". Don Pfingst told Cy, Ted, and myself that Jimmy had prevented the Spirit from working in the assembly for years. Don Pfingst's wife Mae told me, with tears running down her face, "This matter with Jimmy is far deeper than we thought". We realized that brethren universally had been led astray, to accept false witness, to refuse the faithful action of withdrawing from iniquity by brother John Johnson in Adelaide, and to override the exercise of those that were nearest. However, virtually all the leading brethren did not agree with this. An Aberdeen, Scotland brother, James Alec Gardiner, wrote to us, in a letter we read in our care meeting on April 3, that the enemy had gotten into the Adelaide matter in that we had withdrawn from Jimmy Petersen. On April 6, after seeing this clear evidence of the way the tide was turning, I completed the letter I had drafted two months earlier. The next day, my wife and I were musing together: Was it possible that so many leading brethren were wrong and we were right in this matter? Or were we wrong? I told my wife, "If only the Lord would give us some indication, some confirmation, as He did to Gideon with the fleece". Upon saying this, I left for my business appointment at Associated Press. About two hours later, I was there working on a computer program and I went over to a second computer to install the updated program. There was a stack of personnel forms toward the back of the desk, the keyboard was pushed back on the desk, and one form was sitting on the desk directly in front of me as I sat down. As I glanced down at the form, I noticed the neatly typed name at the top: "John Johnson". The following day, we began our journey to a Bible conference in Wheaton, Illinois at which James Alec had been asked to serve. Jimmy had actually written to me a few days earlier, referring to JT's January 20, 1931 letter challenging a brother for trying to settle Columbus, Ohio's matters while visiting Chicago. In Jimmy's letter, he warned me not to try to adjudicate the Adelaide matter while at Wheaton. Interestingly, when brother Will McKillop from Ormond Beach, Florida (Eardly Petersen's wife's brother) stated during the Wheaton meetings, "We're speaking about matters in Adelaide, Australia" and when Ernest Cary from Los Angeles, California publicly stated with whom we were in fellowship in Adelaide (neither brother being local in Adelaide or Wheaton, and Wheaton itself being thousands of miles from Adelaide), I realized that Ernest especially, had fallen into the very error of which Jimmy had warned me! (After the meeting, Ernest Cary approached a sister and told her that we needed her husband and Jimmy Petersen to help with the Adelaide matter. She replied, "But they're not right"! Ernest replied, "Oh, that's right", and quickly walked away. In this way, the Lord exposed Ernest's folly.) During the same meeting, Paul Johnson from Denton, Texas stated that we must accept an assembly judgment even if innocent blood has been shed, and I realized that the whole lump had become leavened (1 Corinthians 5:6). This is morally what took place on the eve of Jesus' crucifixion (see Matthew 26:57-66). The sanhedrim pronounced Jesus worthy of death and the people accepted this judgment, crying out to Pilate about Jesus a few hours later, "Let him be crucified" and "His blood be on us and on our children" (Matthew 27:22-25). The next day, brother James Alec approached me and ackowledged that we rightly withdrew from Jimmy Petersen. I then offered to review what had transpired locally, and its relationship to matters in Adelaide, but he said that he didn't think it would do any good, and just walked away. Realizing the damage Jimmy Petersen had done as to Adelaide and our responsibility locally, we wrote to the brethren in Adelaide and Stawell to confess our sin and clear our borders, in accord with Leviticus 4. At our April 30 care meeting3, Cy and Grace Dadd, Shirley Petersen, and Don Pfingst would not accept this (Cy insisting that we needed the meeting room that was owned by Jimmy Petersen) and walked out of the care meeting in a disorderly manner, without naming or proving evil among us, before we had sung a hymn or prayed at the end of the meeting. We finished the meeting in prayer. As we drove out of the meeting room parking lot, our youngest daughter leaned forward and quietly asked if she could break bread. Shortly after we returned home, Arthur Widtfeldt called to let us know they were thinking of us and praying for us, and wanting to know how we were getting on. He said he had heard nothing of the sorrow which had just taken place in our care meeting. I told him briefly what had happened and that our daughter, whom he had "baptized" some years earlier, had just asked to remember the Lord4. We remembered the Lord Jesus in our home two days later, on Lord's Day, May 2, with about a dozen like-minded brethren, and experienced a wonderful sense of His quickening presence. Within two weeks, in early May, according to Don Pfingst's witness, Cy Dadd came to Don's home, called Jimmy Petersen over, and prodded him repeatedly for about an hour, until he finally acknowledged that we had done right to withdraw from him in January – after which they quickly resumed breaking bread together. About three weeks later, on June 3, they held an "assembly meeting" and "withdrew" from those of us who had not walked out of the care meeting (without contacting, visiting, or notifying any of us beforehand), and notified brethren of their action – via a June 4 letter signed only by Jimmy Petersen. The vast majority of brethren with whom we had fellowshipped for years, and whom we loved (and still love), accepted their action. This outline provides only glimpses of the deep, heartfelt currents of sorrow and joy through which the Lord has changed our lives. Only the Lord knows the "great grief and uninterrupted pain" (Romans 9:1-3) that many hearts continue to bear, as a result of these trials. I just thought to pass on these few impressions of God's ways with some of us and of our responsible part in the sorrows of the testimony. We do wonder at the way the Lord has worked in our lives. See Isaiah 55:6-9. Thank God that He abides faithful despite our unfaithfulness, for He cannot deny Himself! 2 Timothy 2:13. Indeed, we are unprofitable bondmen. Luke 17:10. Well, it is evident that the Lord has not approved the brothers – Jimmy Petersen, Edwin Storr, and JT Jr – about whom Eardly Petersen raised concern in 1955 (in the sense of 1 Corinthians 11:19), but Eardly strongly commended himself, insisting, "I know I'm right". 2 Corinthians 10:18, Job 27:5-7, JBS' article, "The Right Thing in the Wrong Way", and CAC's afore-mentioned article, have proved helpful as to this situation. Many years have gone by since "a little leaven" was introduced among the Christians with whom my family fellowshipped. One might expect that, after prayerfully considering God's ways with us in the intervening years, person's hearts would be affected and softened. But Eardly's wife told us that during a brief encounter with Cy Dadd some years ago, he told her: "I'll never change you, and you'll never change me". We continue to remember the Lord Jesus as He has asked us to do in Luke chapter 22, verses 19 and 20. We desire to reach persons with the gospel of Jesus Christ (Mark 1:1) and to focus on "the end of what is enjoined: love out of a pure heart and a good conscience and unfeigned faith" (1 Timothy 1:5). Simply put, we believe that Christians should separate from evil (see Matthew 18:15-17, 1 Corinthians 5:9-13, 2 Corinthians 6:14-18, Titus 3:10, and 2 Timothy 2:19-22), but that we need to reach out to our fellow man, as Jesus did when He ate with tax gatherers and sinners, spoke with the woman at Sychar's well, fed the multitudes, and much else — and was roundly criticized by the religious leaders of the day. According to Acts 11:26, "the disciples were first called Christians in Antioch". So do we take the name "Plymouth Brethren"? Well, we are happy to be simply called "Christians", and we are not linked with those commonly known as "Exclusive Brethren", "Open Brethren", or "Plymouth Brethren Christian Church". "Well spoke the Holy Spirit through Esaias the prophet to our fathers, saying, Go to this people, and say, Hearing ye shall hear and not understand, and seeing ye shall see and not perceive. For the heart of this people has become fat, and they hear heavily with their ears, and they have closed their eyes; lest they should see with their eyes, and hear with their ears, and understand with their heart, and be converted, and I should heal them. Be it known to you therefore, that this salvation of God has been sent to the nations; they also will hear it." Acts 28:25-28. "Behold then the goodness and severity of God: upon them who have fallen, severity; upon thee goodness of God, if thou shalt abide in goodness, since otherwise thou also wilt be cut away. And they too, if they abide not in unbelief, shall be grafted in; for God is able again to graft them in. For if thou hast been cut out of the olive tree wild by nature, and, contrary to nature, hast been grafted into the good olive tree, how much rather shall they, who are according to nature be grafted into their own olive tree? For I do not wish you to be ignorant, brethren, of this mystery, that ye may not be wise in your own conceits, that blindness in part is happened to Israel, until the fulness of the nations be come in; and so all Israel shall be saved." Romans 11:22-26. 1 See "Letters of James Taylor", volume 2. On page 159, he writes: "The brethren here have been going through a storm, as you will know, and it causes me deep concern, especially as it arose mainly through my own family"; on page 172, he writes: "Still the whole matter was so grave, affecting three of my family, that I have the sense that I should stand by until adjustment takes place". 2 At the time, we "baptized" our children as infants, not understanding that only persons who believe, or profess to believe, on the Lord Jesus Christ should be baptized. (See Matthew 28:19, Mark 16:16, Acts 2:38-41, Galatians 3:27, and C. H. Mackintosh's article On Baptism.) In our spirits, we were actually dedicating our infant children to the Lord in the sense of 1 Samuel 1:28. 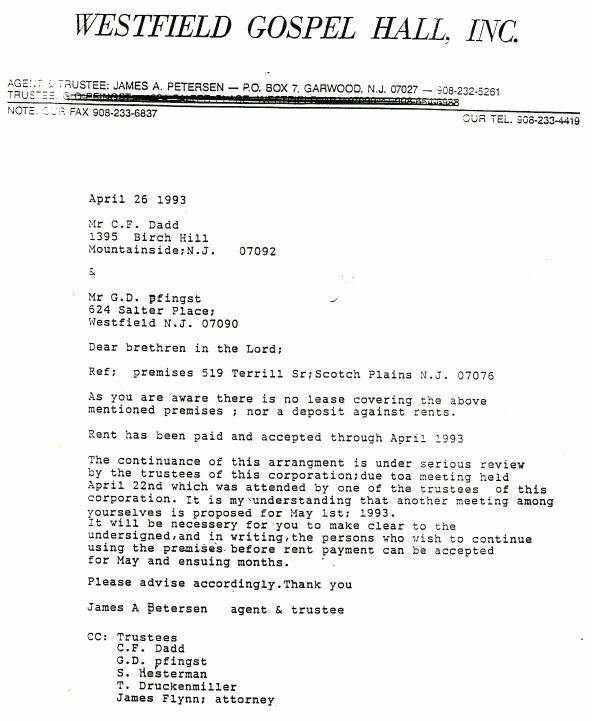 3 Our meeting room landlord, Jimmy Petersen, had written this letter to Cy Dadd and Don Pfingst on April 26 (with copies to Ted Druckenmiller, myself, and James Flynn, his attorney), reminding us that there was no lease on our meeting room and stating, "It will be necessary for you to make clear to the undersigned, and in writing, the persons who wish to continue using the premises before rent payment can be accepted for May and ensuing months". At the end of our Bible study meeting on Thursday, April 29, I raised concerns about the legal implications of this statement. When I pointed out that Jimmy wanted a list of persons who were going to be using the meeting room during the month of May and thereafter, Cy Dadd replied, "I don't think he means that", but Don Pfingst replied, "Well, that's what he wrote". Don added that we weren't going to give him a list. Realizing that we could be charged with trespassing if we used the room for our care meeting on May 1, I suggested (and we all agreed) that we hold our care meeting on Friday evening, April 30 instead of Saturday, May 1. 4 On the next day, Saturday, May 1, Ted Druckenmiller and I called Leslie Mc Farlane, offering to visit with him and others in New York to review what had taken place here. However, he politely declined our offer. 5 See, for instance, these I Met Messiah testimonies of Jewish believers.